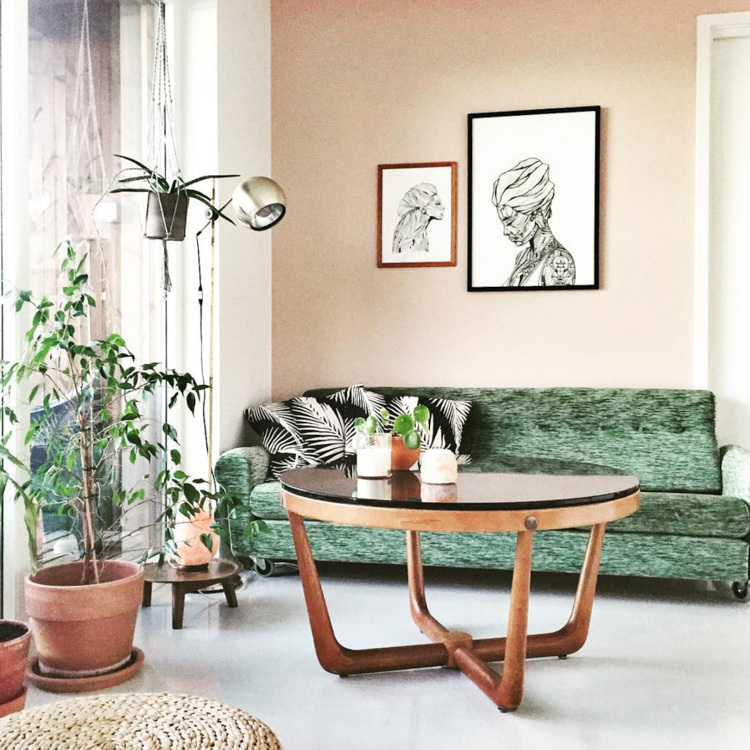 Green and pink accents are popping up everywhere this year - which makes me so happy, since it's one of my favourite combinations - are you a fan too" We've seen everything from the darkest green and emerald to sage green and soft grey-green combined with subtle powder and dusty rose hues. But the 'deco pink' and pea green scheme in this house in Søgne, South Norway brings something new to the scene. Bambi and Heels print by Julie Pike. The house was built in 2011-2012 and designed with large windows to capitalise on the stunning views over the Langeneskilen sea. Camilla, Henning and their son Storm moved in on Christmas Eve, 2012. "It really is wonderful to live so close to the sea," Camilla tells me, "sometimes, when we're having supper we can see fish jumping! Our son Storm is also very fond of the sea and loves to catch crabs and fish." Camilla is a big fan of retro furniture (teak being a favourite! ), contemporary art, and Scandinavian design classics - and of course, colour. "I need lots of colour in my home, I don't feel comfortable otherwise. My favourite hues are pink, turquoise and mint," Camilla explains.